Credit card guarantee required. 72-hour cancellation notice required or full amount is charged. Enjoy a respite from the bustle of daily chores and briefly return to a gentler era. We have created an experience that will surely become a treasured memory for you and yours. Guests enjoy a tableside tea blending, presented in all–silver service by a Pfister Tea Butler while learning about each variety of tea, the origins, unique flavors, effects on mood and health, blending options and perfect pairings. The afternoon tea menu is complete with fresh scones, sandwiches, and pastries. The Afternoon Tea experience at The Pfister hotel is unlike that of any other hotel. On the 23rd floor lounge of the Pfister, you will be surrounded by panoramic views of Milwaukee and Lake Michigan. Treat yourself to a relaxing afternoon of grand elegance in our Milwaukee tea room. We are proud to offer Rishi Tea, harvested in the world’s most renowned regions and headquartered right here in Milwaukee. Enjoy the delightful sounds of live musical accompaniment each day. Enhance your Milwaukee high tea experience with our selections of Essense and Bubbly. 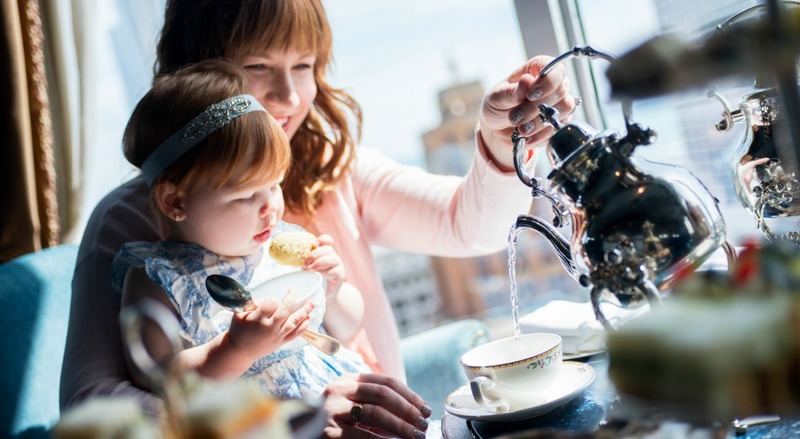 To further set apart the Pfister’s high tea menu experience, the position of Tea Butler was created to facilitate the social and interactive tea experience. The Tea Butler’s role is to speak about the varieties of tea, the countries of origin and unique flavors, the ways that tea affects mood and health, and to offer food and flavor pairing suggestions to go with the varieties of tea. The process of creating unique tableside tea blends provides a creative and personal experience. During each afternoon high tea experience, the Tea Butler will visit the table with a gueridon service trolley to explain the tea, discuss table side blending options and offer tealeaf samples so the guest may enjoy the distinctive aromas of each variety. The Tea Butlers use an all-silver service, including a replica of an 18th century self-tipping teapot. To ensure that individual tea varieties are brewed to the correct temperature, individual brewing units are used for the different styles of teas.